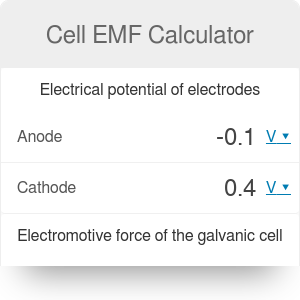 Cell EMF calculator is a simple tool that provides you with the value of electromotive force (EMF) for any galvanic (voltaic) cell with given electrodes potential. If you are a bit confused with all these terms, don't worry! In the article below, you will find a brief description of what is EMF, how to calculate EMF, and examples of electromotive force sources. Moreover, we prepared an explanation of a redox reaction and a galvanic cell. A short step-by-step tutorial demonstrates the usage of our calculator. Scroll down to keep reading! EMF is an abbreviation of the electromotive force. By definition, EMF is a force or an electric pressure which generates current in a circuit. The EMF units are volts [V]. To understand this definition better, consider a typical galvanic or voltaic cell consisting of two electrodes. The electromotive force is the potential difference between them. Additionally, the electromotive force of a galvanic cell specifies the ability of an electrochemical cell to cause the flow of electrons through the electric circuit. where Ecathode is the potential of the cathode (in volts) and Eanode is the potential of the anode (in volts). Remember that in a cell, the potential of the cathode is higher than the potential of the anode. If you want to find the potential of a metal electrode, one way is to check the galvanic series and find the particular metal in the table. Second way is to calculate it using the Nerst equation, also known as the cell potential equation. This formula allows you to calculate the reduction potential of a half-cell or full cell reaction. Click here and check how to do it. Take a look at the EMF calculation example below. 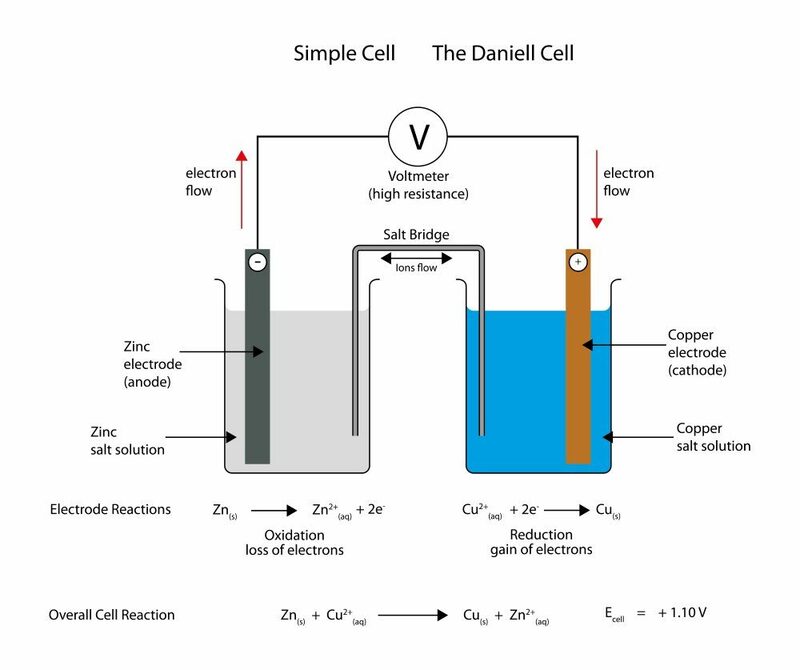 Let's consider a Daniell cell - simple electrochemical cell invented in 1836 by John Frederic Daniell (British chemist and meteorologist). In this cell, copper is immersed in a solution of copper(II) sulfate and zinc is immersed in a solution of zinc sulfate. Check the metal's potential: electrode potential of zinc of is -0.76 V, and of the copper is +0.34 V ⇒ because of lower potential zinc is the anode, and copper is the cathode. Type these values into our calculator. Here it is! The electromotive force of the Daniel cell is equal to 1.10 volts. Each of the EMF sources listed above contains an energy source that induces a flow of electric charges. These sources may be chemical processes (in batteries, fuel, and galvanic cells), mechanical forces (in alternators), electromagnetic radiation emitted by Sun (in solar cells) and temperature difference (in thermocouples). An electrochemical cell is one of the types of energy sources. It can be created by placing metallic electrodes in an electrolyte where a chemical reaction either generates or uses an electric current. Electrochemical cells which generate an electric current are called voltaic cells (named after their inventor, the Italian physicist Alessandro Volta) or galvanic cells (named after the Italian physicist and physician Luigi Galvani). Common batteries consist of one or more such cells. In other electrochemical cells, an externally supplied electric current is used to drive a chemical reaction (which would not occur spontaneously). In any electrochemical process, electrons (gained by a redox reaction) flow from one chemical substance to another. Two metal electrodes (anode and cathode) immersed in a salt solution create a galvanic cell, which induces the flow of an electric current. These metals must have a different tendency to lose electrons. The cathode (+) is an electrode with higher electric potential, and anode (-) is the one with lower electric potential. The oxidation half-reaction occurs at the anode, and the reduction half-reaction occurs at the cathode. Both the anode and cathode are electrodes, but anode is negatively charged, while the cathode is positively charged. The conventional current flow is from the cathode to the anode, while electrons flow from the anode to the cathode. The number of electrons lost by reductant is equal to the number of electrons received by the oxidant (for any redox reaction). Cell EMF Calculator can be embedded on your website to enrich the content you wrote and make it easier for your visitors to understand your message.